Both German cars are based on luxury sedans but have V8 engines with twin-turbos and massive amounts of power and torque. 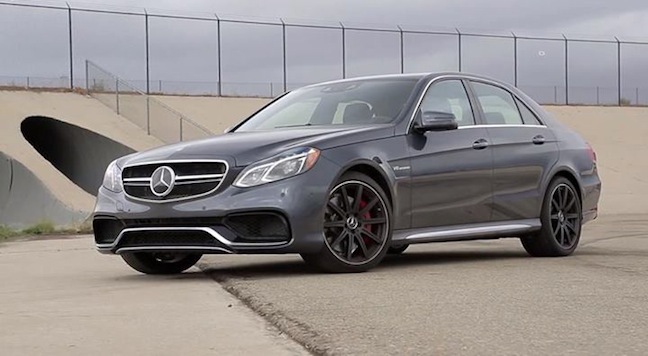 The all-new 2014 Mercedes-Benz E63 AMG S-Model 4MATIC Sedan squares off against the 2014 BMW M5 Competition and it’s a shoot out. But is there a clear winner? Both German cars are extreme performance supersedans and demand respect when you see one coming in the rearview mirror. It’s called “uberholprestige” in German, and it means they earn the right to pass you on the Autobahn. If you see one coming flashing their lights, you better move over and get out of their way. Jonny Lieberman and Mike Shaffer from Motor Trend took the two extremely potent hyper sedans and gave them a thorough test on a canyon road and on the dyno. Between the two, they produce 1152 horsepower and 1092 pound-feet of torque. But that’s on paper and may not actually tell the whole story. So, they also took them for some dyno testing at K&N engineering in Riverside California to see what’s really up. On paper, here are the head-to-head comparison numbers for the two supersedans. 2014 BMW M5 with the Competition package, 4.4-liter twin-turbo V8, 575 hp, 500 lb ft of torque, 7-speed twin clutch automatic, $117,075 as tested. 2014 Mercedes-Benz E63 AMG S Model comes with a 5.5-liter twin-turbo V8, 577 hp, 590 lb ft of torque, 7-speed automatic trans, $106,825 as tested. But out on the quarter mile strip, they can see real world results. The BMW sprints from 0-60 mph in 3.7 seconds and races down the 1/4 mile in 11.9 seconds at 122.2 mph. The Mercedes launches from 0-60 mph in 3.4 seconds travels the 1/4 mile in 11.6 seconds at a trap speed of 121.8 mph. For comparison, the SRT Viper ran the same 0-60 mph in 3.5 seconds, 1/4 mile in 11.5 seconds and speed of 128.7 mph. Both cars are formidable high-performance sedans. Both were identical in breaking, 60-0 mph braking in 106 ft. But one true test of a supersedan is how it handles in the corners. Both mid-size high-performance luxury sedans were close in performance, but one came out ahead in the minds of the two drivers. Which one is the winner? Jonny Lieberman and Mike Shaffer from Motor Trend, both thought the 2014 Mercedes-Benz E63 AMG S Model was the clear winner in power, performance and overall driving dynamics. But the 2014 BMW M5 Competition wasn’t far behind. Which car would you buy? Watch 2014 BMW M5 Competition vs 2014 Mercedes-Benz E63 AMD S Model video.